In my twenties, I discovered I was part Romany. This really blew my mind. I didn’t know much about the culture and didn’t feel any connection except that I loved Stevie Nicks and the song Gypsy. Shallow, yes? But then I started to think more about my hidden heritage and I found some threads that connected me to it. Or at least to the cliches our culture had taught me. I love to dance. I read Tarot. I’m into the mystic. Dress kinda boho. As a young teen, I traveled (by thumb, not caravan) across much of the country. Nobody in my family thought anything of it. My grandfather rode the rails as a young man, staying in hobo camps, swapping stories and having adventures before completely reinventing himself into the very proper and mannered gentleman I always knew. So, wow, I was shocked. For a minute. Then I remembered his mother read tea leaves during the Great Depression to keep food on the table. When my grandfather reinvented himself, he changed his name, (first, middle, and last!) married up, moved to a new state, and worked his way into an executive position at Ford Motor Company. He didn’t have much to do with his family of origin anymore. “We embarrass him,” one of my great-aunts commented during a visit I made to the old neighborhood with my mother. Things kind of clicked into place. I didn’t know I had Rom blood because he didn’t want me to know. And that’s one of the things my character Laurel, from my own Gypsy (the title a homage to Ms. Nicks), has in common with me. Her mother has a reason she doesn’t want Laurel and her sisters to know they’re Rom. And it’s really bad. But Laurel has secrets of her own. She visits a magical place called Paradise Fields with a little boy named Ryan, her guide to another dimension, but more, someone who leads her through space and time. Laurel’s mission is to travel the world to sit in compassion with dying children as they pass into other realms. It’s her life’s work, and nobody knows about it. Then one day, Ryan takes Laurel to a young girl in Romania who doesn’t die. Next, Laurel aids another young girl, much closer to home. After Laurel’s promotion, things get scary. She has to stop murderers and rapists and doesn’t know much about how to work with her powers. It’s a learning on the job situation. Laurel’s life takes another even more thrilling turn when swoony gyspy cop Nate Haywood enters the picture. Nate asks Laurel for promotional help (her day job) with the threatened Rom in their tiny, tight community. As their attraction grows, Laurel finds her secret life difficult to conceal from Nate. There are mysteries solved, love stories consummated and sad passings in this paranormal novel I wrote (along with it’s follow up novella, Sweet Melissa) exclusively for Amazon KDP. You can check Gypsy out of their library for free or purchase it. I had so much fun researching the real Romany community as I wrote these stories. The culture my body only contains a strand of is more rich and intriguing than Stevie Nicks ever imagined. That’s one of the great things about writing stories. They connect you more deeply and fully to what you already want to know. Special shout-out to Helen Christmas for the invitation to join the “Meet My Character” tour. Read about her own character here. Helen sets her books where she lives, in England. ‘Beginnings’ introduces a character from her series that begins with ‘Same Face Different Place,’ a 1970s romantic thriller set London. The 2nd book of the series ‘Visions’ is set in rural England, in the era of the 1980s. Helen is busy at work on her 3rd book. Love the post, Cynthia! 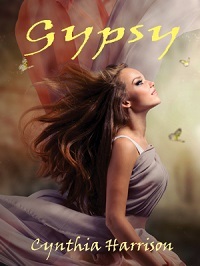 I have Gypsy in my TBR pile though I admit to sneaking a peak and finding the characters and setting intriguing. I’m looking forward to reading it. And I love the cover. Thanks for sharing about your fascinating background and your enjoyment of the research. Amazing you hitchhiked around the country. I used to hitchhike around my small town. Now I’m being a bit of gypsy on a long journey to discover other cultures. Ooh, Nia, I love being in your TBR pile:) I never would have written Gypsy if it wasn’t for the secret my family kept, well, and Stevie Nicks:)) Hope you enjoy! Thanks Jenanita, I loved learning about the various rituals and customs and incorporating them into the books. I also loved discovering why I’m such a wanderer … it’s in my blood. Thanks so much:) It’s funny the way our own lives weave themselves into our stories. Happens every time!